Status: Went missing July 2014 – presumed deceased. No breeding attempts made. Summer 2010: Largest and arguably the most handsome male. Also one of the oldest birds. 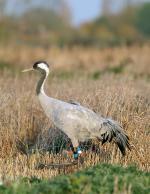 A top ranking crane, often found in a small cohort with Gemma and Michaela. Despite his size and age, he was very shy to come out of his coop at the crane school and also spent his first potential night of freedom in Somerset within his aviary! He is only ever aggressive if challenged, and few birds seem to have the nerve to challenge him. September 2010: Clarence is still a top-ranking bird, and is the centre of the largest of the cohorts. His close gang now include Wendy; Gilbert; Gemma and Michaela and are also often accompanied by Tamsin, Cosmo, Jack, Twinkle and Bart. Despite staying within the aviary for the first day of release, he has been slowly but surely making his way out into the wider countryside, and his behaviour has been impeccable. October 2010: Clarence is still a strong leader of the largest cohort and is often seen leading the group to new areas for foraging. November 2010: In recent weeks the cranes have all joined forces with Clarence’s group and are now usually moving as a group of 20. They have found new fields to explore and are often found foraging on maize stubbles, Clarence’s new favourite food. January 2011: Clarence is very much one of the flock - with the whole body of birds largely acting as one over through the coldest December on record. Although one of the oldest, he is not yet showing much sign of his white cheeks but has developed one of the darkest crowns of the group. 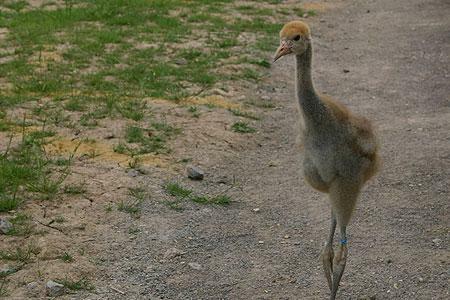 March 2011: Clarence has come through the winter and he's well on the way to obtaining his adult plumage. Although at present like the rest of the birds, he is looking rather scruffy due to being heavily in moult. April 2011: A couple of days after his 1st birthday, Clarence flew to Catcott and Shapwick with Gemma, Bart and Chris where they roosted the night, before heading back to join the rest of the birds in their more usual haunts around Aller Moor. 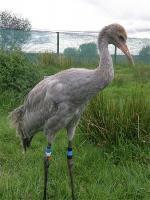 September 2011: Clarence is now a stunning full grown crane, with most of his crisp adult plumage. 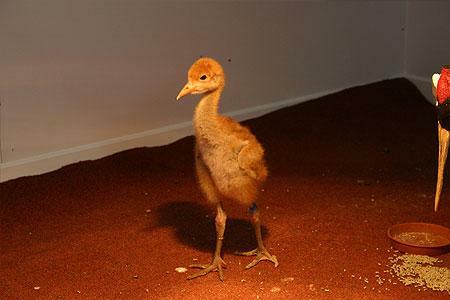 Although he was the largest crane for a period of time, the other birds are now of similar size but he is a bit more chunky. Whilst some of the other 2010 cranes use their size to intimidate the 2011 youngsters, clarence is quite tolerant of their integration, and has been quite approachable by both youngsters and costumed 'parents'. June 2012: Clarence is a truly stunning and MASSIVE crane. He has been strutting his stuff in Somerset this spring, and in early June, over the Jubillee weekend - he flew as part of a group of 11 birds up to Slimbridge in Gloucestershire, but returned to the Levels and Moors the following day. April 2013: Clarence seemed to be forming a bit of a bond with Regina (Red Yellow Red) during the latter part of March, but has also been seen often on his own, or amongst the youngest birds, near the autofeeder on Aller Moor - so he may be struggling with a bit of illness... or perhaps he's in love! May 2013: Clarence is still hanging around a lot on his own and seems to be having some difficulties with flight - he may possibly be starting to go into moult. We are keeping a close eye on him. July 2013: Clarence did eventually go into moult but not until July - and was seen once again following this very risky period of their lives. However - he has not been seen since - which is rather worrying. We hope that we will see him at some point again - but for the moment his whereabouts are unknown. May 2014: Clarence has still not been seen, and his status is unknown. May 2015: With Clarence not being seen for well over a year now – his status has been changed to deceased.